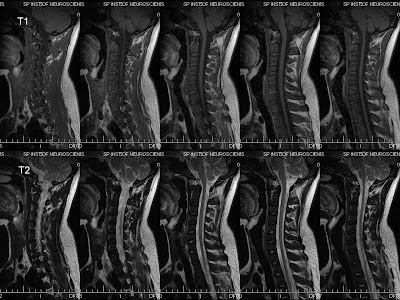 An 18 y o male, MRI cervical spine c/o of neck pain. Previous 2 year old lab reports mentions, macrocytes with anisocytosis and poikilocytosis. Low RBS count and Hb. Increased MCV ( mean corpuscular volume) and MCH ( mean corpuscular hemoglobin). Normal MCHC (mean corpuscular hemoglobin concentration- 34 g/dL). Lab findings are suggestive of megaloblastic anemia. 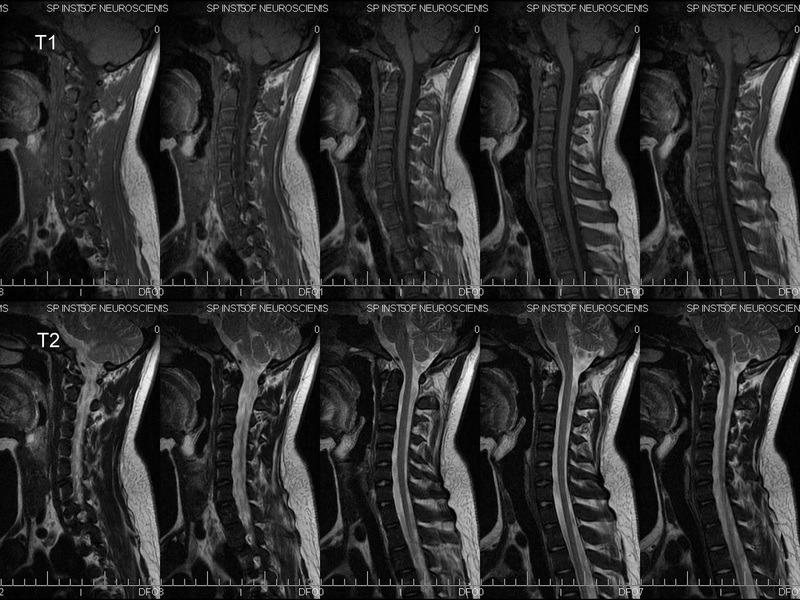 This MRI cervical spine show diffuse low marrow signal, iso intense to skeletal muscle. Signal abnormality is diffuse and homogenous. Vertebral bodies as well as posterior elements are equally involved. Inter vertebral discs are spared. No abnormal T2 hyperintensity on STIR to suggest any marrow odema. The lab findings of long standing megaloblastic anemia with diffuse low marrow signal on T1 supports hyperplastic marrow on MR imaging. The similar signal abnormality involving clivus again goes in favour of a benign reconversion process rather than a more serious neoplastic marrow infiltrative or proliferative disorders. Hyperplastic marrow is a hemopoetic marrow. Hyperplasia also called marrow reconversion, from fatty to hemopoetic marrow. Normal physiology is, in the neonate, all is hematopoietic marrow. Normal conversion from red (hematopoietic - T1 low) to yellow (fatty - T1 bright) marrow begins few weeks after birth, a gradual and progressive process, involving distal ends of distal most long bones first, exend towards axial skeletal. The adult pattern of bone marrow attained by approximately 25 year, where hemopoetic marrow is confined to only the axial skeleton (pelvis, vertebrae, sternum, ribs, and skull) and the proximal shafts of the femora and humeri while the remainder of the skeleton show fatty marrow. The location and extent of the relative amounts of hematopoietic and fatty marrow depends primarily on age and the bone. In marrow hyperplasia or reconversion, this hemopoetic marrow is increased. The numerous disease processes cause this “reconversion” , chronic anaemia is common and important cause. Apart from hyperplastic marrow other differential diagnosis for such diffuse low marrow signal intensity on T1 and T2 MRI is fluorosis, myelofibrosis, mastocytosis, lymphoma, osteopetrosis, osteoblastic metastasis, and Paget’s disease. MRI is ideal for bone marrow screening because of its high-resolution images with great soft-tissue contrast. Protocol for screening of bone marrow should must include FSE T1 and STIR and if possible FSE T2. • FSE T1w : A routine T1-weighted image without fat suppression is one of the most important sequences for distinguishing between normal and abnormal marrow. Normal bone marrow is composed of both fatty and hematopoietic elements. Although fatty marrow contains more fat cells than hematopoietic marrow, both types of marrow appear hyperintense relative to skeletal muscle on T1-weighted imaging because they contain a higher proportion of fat cells relative to skeletal muscle. Abnormal marrow is iso - hypointense to skeletal muscle on T1-weighted imaging because the replacement of fatty marrow elements by the pathologic process causes loss of the normal fat signal. • STIR: are extremely sensitive for detecting fluid and so areas with bone marrow oedema appear as hyperintense relative to the background of normal signal suppressed fatty marrow. • FSE T2w: Not primarily used for assessing bone marrow abnormality because both fat and fluid appear bright on T2w sequence. Thus, a pathologic marrow lesion could potentially be overlooked against the background of normal bright fatty marrow. Use of T2 is confined to evaluation of an associated neural element compression.